Washington, often in federal agencies with vast sway and little accountability. According to a March poll, 74 percent of Americans believe that a deep state probably exists. Five years ago, the Connecticut legislature decreed that all owners of so-called assault weapons (which included any semi-automatic rifle with a pistol grip) must register their firearms. Perhaps as few as 15 percent of gun owners bothered to comply with the new lawmeaning that Connecticut had up to 100,000 criminals living within its border. A 2016 Albany Times Union editorial lamented that 96 percent of roughly 1 million New Yorkers who owned so-called assault weapons failed to comply with registration requirements. California gun bans have been met with similar, massive non-compliance. Undeterred, local governments have begun jumping on the bandwagon. Deerfield, Ill., recently decreed a $1,000-a-day penalty on anyone who fails to surrender or disable their semi-automatic firearms with cosmetic features that frighten politicians and editorial writers. While such laws were made by elected officials, it is unelected bureaucrats who are largely left in charge of enforcement, and that can cause big problems for gun owners. Just before press time for this issue, it was reported that a California farmer who was simply trying to meet the states ever-changing restrictive gun laws by registering his rifle is being charged with 12 felonies after the state DOJ determined his AR-15 to be illegally modified. That determination served as grounds for the agency to raid the mans home and confiscate 12 firearms, 230 rounds of ammunition and two suppressors. He was later released on $150,000 bond, and at press time the case was still pending. The deep states surveillance and investigative powers make it far easier to target firearm-ban scofflaws than in earlier times. Anti-gun sentiment will seek to legitimize any surveillance or enforcement efforts carried out by federal agencies. At a time when politicians are shamelessly comparing the National Rifle Association to a terrorist organization, gun owners may face much wider assaults on their rights and privacy than have previously occurred. Politicians have long relied on the secrecy of deep-state agencies to carry out campaigns intended to undermine the Second Amendment. After the 2014 showdown at a Nevada ranch, the FBI created a bogus independent film crew that spent a year hounding and videotaping the Bundy family and their supporters to gin up federal charges. Last January, a federal judge dismissed the case against the Bundys, in part because of pervasive FBI lying (including three years of denials that an FBI sniper team was deployed near the Bundys home). But the FBI suffered no penalty, and there is no reason to expect the agency will not try the phony film crew gambit again. The deep state has more levers than most Americans recognize. Because Congress has designated more than 4,000 criminal offenses and federal regulatory agencies have greatly expanded these through interpretation and rulemaking, bureaucracies have vast discretion to target whom they please. In 2012, the Obama administration launched Operation Choke Point, supposedly to choke illegal businesses access to financial services. The Justice Department and the Federal Deposit Insurance Corporation (FDIC) targeted firearm dealers, resulting in legitimate businesses having their assets frozen based on mere suspicion that they had failed to complete federal background checks on purchasers. [to ensure] banks get the message about the businesses the regulators dont like, and pressuring banks to cut credit or close those accounts, effectively discouraging entire industries, according to an analysis published by The Daily Signal. FDIC Chairman Martin Gruenberg testified to Congress in 2015 that bank examiners had misinterpreted regulatory guidance to suggest that entire categories of businesses [including firearm dealers] should be barred from traditional banking services, The Hill reported. Rep. Sean Duffy, R-Wis., complained that fdic officials were weaponizing government to meet their ideological beliefs. Operation Choke Point has been terminated, but legions of laws and regulations that could permit federal agencies to deny due process to any business that politicians dislike remain on the books. Federal agencies or federally funded organizations have also declared that individuals can be considered dangerous extremists for stockpiling ammunition, displaying the Gadsden (Dont Tread on Me) flag, asserting a right to keep and bear arms, having a Know Your Rights or Lose Them bumper sticker, or visiting online extremist websites/blogs. Some of those definitions seem designed to cause people to burst out laughing at their absurdity. But the fact that politicians are seeking to use catch-all notions of suspicious activity to disarm peaceful Americans is not funny. Two years ago, Democratic senators conducted a filibuster in favor of prohibiting anyone on a terrorist watch list (which together now include 1.5 million names) from buying guns. Were just asking for terrorists not to be able to walk into a gun shop and buy a gun, Rep. Sheila Jackson Lee, D-Texas, declared. The fact that the lists contain the names of vast numbers of people who are not terrorists was irrelevant to anti-gun politicians. Names can be added to those watch lists based on the scantest evidenceor even no evidence at all. Obama administration officials boosted tenfold the number of people included on the so-called no-fly list, which was so slipshod that it repeatedly blocked the late Sen. Ted Kennedy, DMass., and Rep. John Lewis, DGa., from traveling. Once someones name was added to that list, he was left in bureaucratic purgatory and had to fight for years to even learn why he was on the list to begin with. Even a Los Angeles Times editorial opposed the no fly, no buy ban, declaring that owning a gun is a recognized right, and we find it dangerous ground to let the government restrict the exercise of a right based on a mere suspicion. But when anti-freedom politicians want to disarm Americans, mere suspicion is apparently sufficient. The proliferation of anti-gun laws and regulations in recent years has strewn the nation with tripwires for firearm owners. DHS has given local and state governments more than $50 million to purchase license plate readers for police cars. John Filippidis was driving with his family through Maryland when he was pulled over by a Maryland transportation policeman outside a Baltimore tunnel. The policeman ordered Filippidis out of his car and angrily demanded to know where his gun was. Filippidis has a Right-to-Carry (RTC) permit from Floridawhere he had left his firearm. Police spent hours questioning him and searching his minivan before permitting him to move on, leaving his wife and daughters utterly distraught. Maryland police have targeted and rigorously searched other out-of-state drivers with RTC permits (which Maryland does not recognize). Federal grants enabled Maryland to equip hundreds of police cars with license plate scanners that create almost 100 million records per year detailing exactly where and when each vehicle travels. License plate readers are also being used to create federal records of individuals who attend gun shows. The Wall Street Journal revealed in 2016 that Immigration and Customs Enforcement (ICE) arranged for local police to scan license plates of attendees at a southern California gun show. ice officials told the Journal that ice has no written policy on its use of license plate readers and could engage in similar surveillance in the future. A 2015 ACLU investigation concluded that Drug Enforcement Administration (DEA) and ATF also used license plate readers to round up information about gun show attendees. If you have attended gun shows in recent years, that information could be on a federal dossier. More importantly, that fact might be used by law enforcement to justify further investigation of you. At the local and state level, gun owners can be imperiled by deep state-style mandatory reporting requirements spurred by politicians who seek pretexts to disarm as many citizens as possible. After railroading a prohibitive gun bill through the state legislature in 2013, New York Gov. Andrew Cuomo declared: People who have mental health issues should not have guns. They could hurt themselves, they could hurt other people. But tens of millions of Americans visit therapists each year, and mental health issues is vague enough for lots of political mischief. The law intended for county health officials to vet the recommendations that nurses, social workers and others made for disarmament, but the vague standards produced a tidal wave of notifications. As a result, county health officials effectively become clerical workers, rubber-stamping the decisions, The New York Times reported. Now, some anti-gun activists consider the New York law a model for imitation in other states or at the federal level. Even the American Civil Liberties Union opposed the new mandate, asserting that it reinforces the harmful stereotype that people with mental disabilities, a vast and diverse group of citizens, are violent. Congress and the Trump administration speedily overturned the new rule last year. But the fact that such a policy was even promulgated is a bellwether of future attacks on the Second Amendment. Some gun owners believe the deep state poses no peril to them because they are entitled to due process, a presumption of innocence and other constitutional rights. 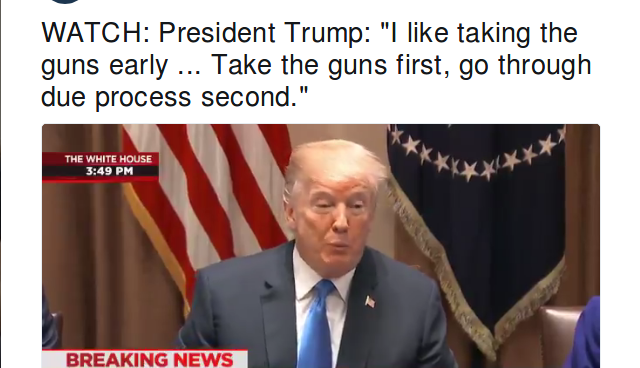 But such assurances can quickly become mirages when many politicians portray every privately owned firearm as a massacre in waiting. Many liberals will champion any show us the gun and well find a crime crackdown. Those who have nothing to hide, have nothing to fear is an old saying designed to breed docility. But gun owners can afford to accept this adage less now than ever before. The deep state stands ready to exploit the rising tide of laws that turn gun owners into criminals who can be destroyed for political and bureaucratic profit. So, what does Lew Rockwell suggest gun owners do ? Hug your guns and Bible. I remember seeing him say that at the time !! I DID NOT LIKE IT !!! For full disclosure, I voted for Trump. I did not trust him, but for sure did not trust or want the witch. After he said that, that enhanced my distrust of him !!! Unfortunately, the deep state could increasingly focus on gun owners in the coming years. I thought 3-D printers and software took care of all this a few weeks ago.